Q: In renovating our house and adding a garage, we created a new space that measures 13 feet by 15 feet I've enclosed a sketch of the room andÂ the adjoining kitchen and master bedroom. 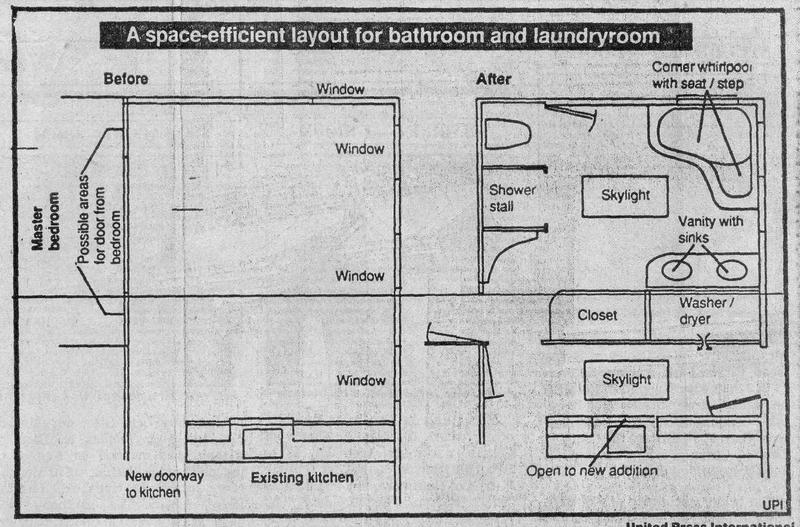 We would like to incorporate into the plan a laundry room with a washer-dryer and a large bathroom. We will also need eventual access to the back yard when we add a new deck (and clothesline). I thought we could replace one of the windows with a door at that time. In the bathroom, we would like a whirlpool tub with a separate shower stall and, if possible, a vanity with two sinks. The roof is slanted, and we thought a skylight might be effective. I'd really like this lovely new space to be used to its best advantage. A: In presenting your question, you didn't mention any plumbing restricÂ­tions, so I am assuming that the fixtures can be installed where they are best suited. 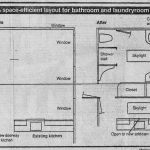 As I graphed out the room and read your requirements, it made sense to put the laundry room and future access to the back yard and deck close to the kitchen for convenience. It also follows reason to have the master bathroom at the far end of the addition, away from the noise. A hallway that runs parallel to the existing kitchen wall will eventually provide the most convenient way of getting outside. Consequently, the winÂ­dow closest to the kitchen is the one I would plan on replacing with a door. Close to the exit, on the left, I would build a closet to house your washer and dryer. The doors can be shut when they are not in use. You mentioned a clothesline and this is certainly a convenient spot for the washer when hanging-clothes outside (Be certain to put the washer on the left, so the swing of the doors doesn't present a problem). Consider installing a skylight in the hall, which will provide light not only for that area, but for the kitchen sink as well. To the far left of the hall, opposite the entry into the kitchen, I would put a door leading to the master bath. Just past the door, immediately on the left, I would knock through to the master bedroom. Doing this enables you to have total privacy while using the bedroom and bathroom, but also alÂ­lows you easy accessibility to the hall and kitchen. I positioned the shower stall and toilet against the solid wall adjoining the master bedroom. Because of the windows, there aren't a lot options. I put the toilet in the far corner, to the right of the shower stall, in order for it to be as inconspicuous as possible. If desired you could put a door front to close it off when not in use. I graphed in a whirlpool designed specifically for a corner.Â It fits well under the windows, and would be very attractive there. The curve of the design is also aÂ pleasant relief from the squareness ofÂ the room and provides a softer look inÂ the bathroom. I put the vanity with two sinks along the back of the washer-dryer closet and rounded the edge toÂ continue the curvilinear effect in the room.